19th Century farming along the mighty Mississippi river. 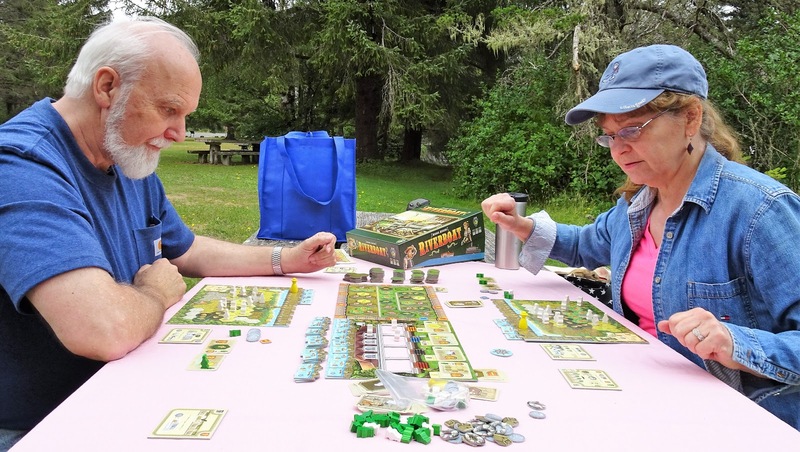 Riverboat is a point salad kind of game where players use vegetable crop tiles to help create the salad. The object of the game is to score the most victory points. Points can be gained by planting crops on a player’s board, by harvesting crops to obtain riverboats, by activating various scoring elements (barns, wells, and opportunity cards). By populating the city of New Orleans with agents, and completely filling sections of their player board. A game consists of 4 rounds with 5 phases in each round. Each round starts with players selecting a tile representing 1 of the 5 phases until all phase tiles have been selected. Some players will end up with more than one phase tile. The player who took the Phase 1 tile – Cultivation will now begin the round by taking the bonus indicated on that tile and then performing the indicated action - - in this case turning 8 cultivation cards, representing one of five color fields) one at a time face up. Every player will place one of their workers on an empty hex space within the field indicated on the cultivation card. Once everyone has placed a worker, the next card is revealed and so forth until each player has placed 8 agents. The key is to try and group workers in configurations that will match the Planting tiles. Phase 2 – Planting begins with the player who took the respective tile receiving the indicated bonus and then performing the indicated action - - taking 1 of the available crop tiles and places it under a set of workers previously placed on their board. There are crop tiles of 1, 2, & 3 spaces. When placed, each crop tile space must have a worker on top. So again, the placement of your workers in Phase 1 is important. Crop tiles have a combination of 5 different vegetables on them with one vegetable type per space. In turn order each player will select a crop tile and place it on their board continuing the process until all workers are standing on a crop. Repeat the same process for Phase 3 – Harvesting and Shipping, Phase 4 – Opportunity, and Phase 5 – Scoring with the player who selected that tile beginning the phase. During Phase 3 players will take their workers off their boards in groups by vegetable type to claim Riverboats that can provide benefits. The more workers on a type of vegetable allows players to acquire more powerful Riverboats. 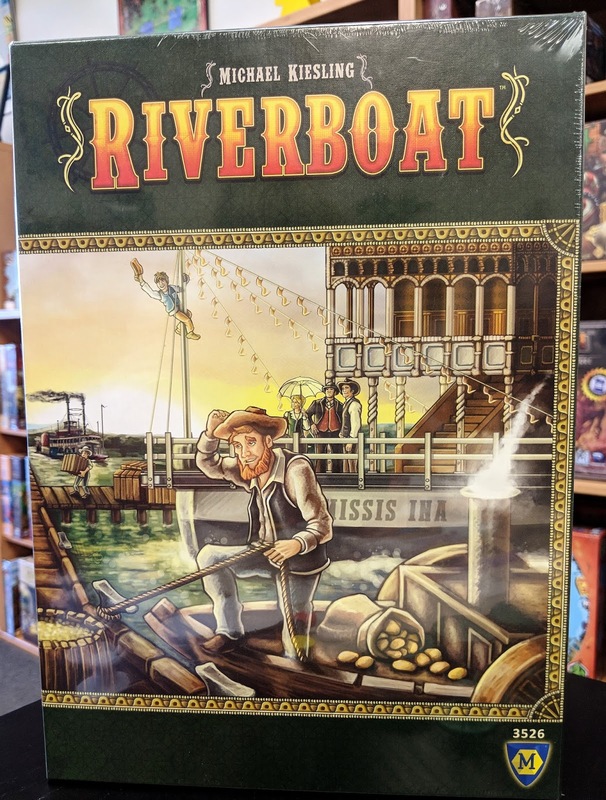 Players can acquire only 2 riverboats per round. During Phase 4 players will select an opportunity card from one of the slots on the New Orleans board. Each slot has an immediate bonus. Each Opportunity card provides a special scoring bonus that is not realized until it is activated during the Scoring phase of any round. In Phase 5 – Scoring, players will use their surveyors to score up to 2 elements, per round. Each player begins the game with 2 surveyors. More can be gained during the game, but are somewhat challenging to gain. The types of scoring elements are barns, wells, and opportunity cards that were gained during the previous phases. In summary bonuses are awarded in a variety of ways throughout the game: taking a phase tile, acquiring a riverboat, taking Opportunity cards, and harvesting 9 crops of a single vegetable type. These then allow players to gain barns, wells, additional surveyors, move their harbor master next to their acquired Riverboats, and placing agents in New Orleans. At the end of each Round, the various tiles and cards on the central boards are replenished. Players begin again by selecting the Phase cards. Play continues until the end of Round 4 when a final scoring takes place. Additional points are awarded for remaining coins, completed areas on your player board, boats passed by your harbor master, and for having the most agents in New Orleans. Riverboat is a game with easy to understand mechanics, but some serious depth in game play. With a little bit of luck and some good decision making, you could be the winner of Riverboat. 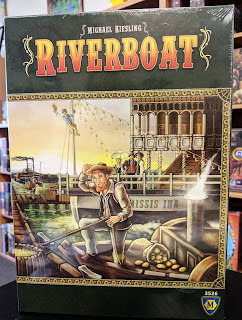 We have an open copy of Riverboat available in our Demo Games Library for you come in and try.